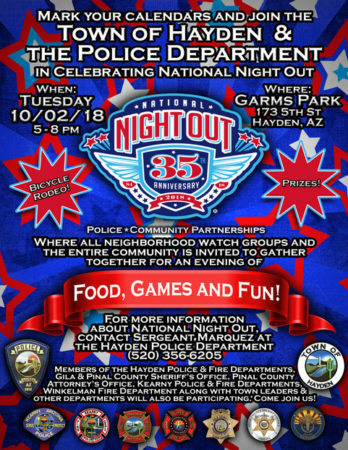 I ran across Sergeant Marquez from the Hayden Police Department the other day, and he excitedly told me about the National Night Out celebration which will take place on Tuesday, Oct. 2, at Garms Park on 5th Street in Hayden. “All of us are working together on this,” said Sgt. Marquez, referring to the joint sponsorship of not just the Hayden Police Department and Fire Department, but also the Gila and Pinal County Sheriff’s Offices, the Pinal County Attorney’s Office, the Kearny Police and Fire Departments, the Winkelman Fire department, and various town leaders. The National Night Out is familiar to me, but I thought it was an urban thing to “reclaim the night” from crime and disorder. Sgt. Marquez said that rural towns were using the night to show community solidarity, to make children familiar with police officers and fire fighters, and to encourage the development of community watch groups. Well, Tuesday the 2nd of October is coming quickly, and I hope just about everyone in the Copper Basin will crowd into Garms Park in Hayden from 5 p.m. to 8 p.m. to enjoy the evening which will feature a bicycle rodeo, food, games, prizes and fun. 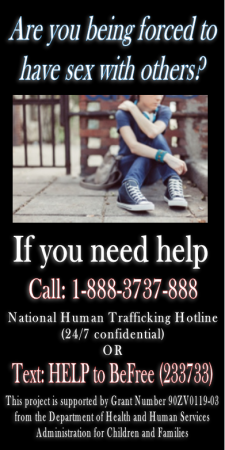 For more information, contact Sgt. Marquez at the Hayden Police Department at (520) 356-6205. In Mammoth this Saturday, Sept. 29, an indoor/outdoor community yard sale is taking place at 115 Main St. from 8 a.m. to 2 p.m. Indoor and outdoor spaces are still available. Just call Susan Sanchez (520) 447-6055, Ruben Hernandez (520) 429-5997 or Gilbert Hernandez (520) 400-0423. The San Pedro Valley Lions Club is sponsoring this sale. With this slightly cooler weather we’ve been having, the sale should be a pleasant experience. The group of artists which meets in Kearny every Friday from 9 a.m. to 3 p.m. continues to seek new artists to join them. All art mediums are welcome and anyone, new or experienced, can benefit from working in the company of other artists. The group meets at Ray Hall of the Church of the Good Shepherd on Senator Chastain Street, below the schools. Come spend the day and see for yourself if this is something you want to do. 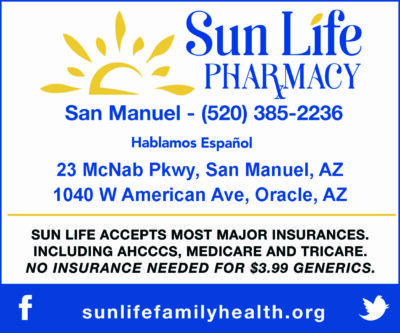 For information, contact Sam Hosler at (480) 220-9349. Disclosure: Yes, I’m a happy member of this group. The Copper Basin Chamber of Commerce met with area business people this past weekend to explore ways that the Chamber might be more responsive to the area’s business needs. It was a good meeting, with lots of important sharing. This week the board of the Chamber will issue a notice of its desire to hire a new director for the Chamber to help with area events and to develop approaches for better business support. The Chamber is readying everything for the Great Pumpkin and Trunk or Treat later in October with the help of the Junior Chamber of Commerce. But even before that, Norm’s IGA will hold its Pumpkin Patch on Saturday, Oct. 20, from 10 a.m. to 2 p.m. There will be vendor booths with games and other surprises. If you would like to have a booth, contact Myra Warren at (520) 827-0505 before Friday, Oct. 5. That’s all I can fit in this week. Enjoy our cooler mornings, but stay hydrated!